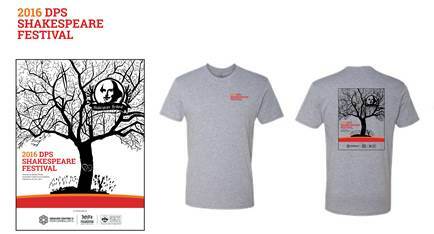 This year’s 32nd Annual Shakespeare Festival t-shirts are here! They are by no means required, but serve as a fun souvenir for you and students. This year’s design comes from Kunsmiller Creative Arts Academy sophomore Brenda Flores. Big thanks to the Denver Center for the Performing Arts for their graphic design work, and to Your Art Department Apparel for production. All t-shirts are grey, with the same design (see below). You will be able to pay upon pick-up. Payment can be made with a check made out to Denver Public schools (sorry, no cash or credit cards)!